The AudioBox 22VSL introduces a new generation of PreSonus USB 2.0 audio/MIDI interfaces that take hardware/software integration to the logical next step. Using your computer CPU and PreSonus Virtual StudioLive (VSL) software, the AudioBox 22VSL interface provides a 4x2 mixer, reverb and delay effects, and the same Fat Channel compression, limiting, semi-parametric EQ, and high-pass filter, as the PreSonus StudioLiveTM 16.0.2 digital mixers all with inaudible latency. Now you can monitor and record with or without real-time effects! 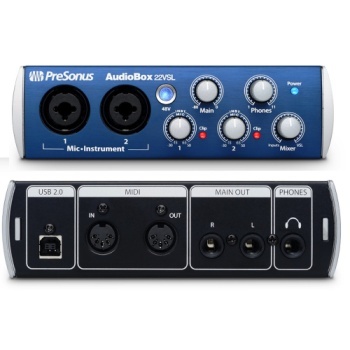 To top it off, while the classic PreSonus AudioBox USB is a fine-sounding unit, the new AudioBox VSL series sounds even better, with 24-bit, 96 kHz recording and top-of-the-line PreSonus XMAXTM preamps. We’ll have more to say about the preamps shortly.